This marks my first review of a preview copy of one of Angry Robot Books' titles through their Angry Robot Army program. It's a pretty interesting arrangement where geek readers like me get access to advance review copies of various titles given the understanding that we'll eventually post reviews of said titles. And since the Geeky Guide is always in need of good content, I figured it wouldn't hurt to try it out. And this book was certainly a very fun first read that gives me hope for my continued dealings with Angry Robot Books as a whole. While I've read a lot of comic books in my time, I've read very few superhero novels apart from adaptations of comic book stories like Kingdom Come and the Neil Gaiman / Michael Reaves romp InterWorld, which wasn't strictly a superhero book but certainly featured a boy with unique abilities. It's just not a genre that you find a lot of titles about apart from those adapted from the big comic book titles from DC and Marvel. So to experience an independent attempt at tackling a superhero story does make for a rather refreshing experience. 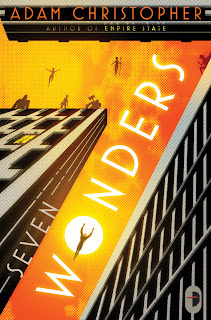 Synopsis: Seven Wonders is a superhero novel written by Adam Christopher, who also wrote the superhero noir book Empire State. It is slated for release by August 28 in the US and Canada and by September 6 in the UK. The book is set in an Earth filled with superheroes. But it has also reached a point when most super-villains are no longer free to roam the planet - all save one. The Cowl calls San Ventura home and thus he is matched by one of the greatest super hero teams around - the Seven Wonders. This JLA-style pantheon of heroes does their best to keep the city safe in opposition with the very last villain while the rest of the world lives largely in peace. But now a man named Tony finds himself in possession of super powers of his own, and he decides to finally do what the Seven Wonders have consistently failed to do - to finally put an end to the Cowl's reign of terror and become the hero they have all forgotten to be. But there's more to all this than just heroes villains a super-villain. There are many secrets beneath the surface, the struggle of ordinary policemen overshadowed by super-powered heroes and a girl seeking revenge. At first the book seems to start with an older, almost campy tone as we hear about the city of San Ventura and the great heroes that call the city home. We have your classically nefarious villain staging mysterious heists around the city leading up to a big evil plan that will be revealed at a much later time. But at the core of it we have a new hero who is fed up with the back and forth cat and mouse games between the Seven Wonders and the Cowl. Here we have a man who is determined to prove that he actually knows better than the city's protector's now that he's the one with the power. And that kind of new strength can lead a man to do some pretty extraordinary things. The book also has an interesting human angle in things as we follow around the detectives who have gotten used to living in a city where heroes do most of their jobs. Even though there is a special section of the police department dedicated to dealing with crimes of an extraordinary nature, they're still vastly underpowered and quite out of their league compared to the Seven Wonders. But they struggle on and try to find a way to figure out who the Cowl is first before the Wonders apprehend them. The book is nicely complex - something that only happens in the longer term as the book progresses. At first it feels like things are moving steadily along given the brevity of each chapter and the very comic-book pacing of things. But in time you'll realize that your progress through the book is slower than expect and you're reading more than just a story that would have been covered in a comic book issue or two. Instead we have what is the equivalent of a major comic book crossover event across several titles given the number of twists and turns the story takes. And this isn't a bad thing - it makes the whole adventure richly complex. There are times when I wish that the author had taken more time to build and develop the characters instead of just having them there and acting out their roles. It's hard to precisely describe what I mean by this but largely it has more to do with how little we know of each of them other than their names until the very end of things. I can respect the slow reveal and the benefit of a little mystery but at times we still need to know a bit more than what were are given as readers in order to develop stronger emotional ties with these people. 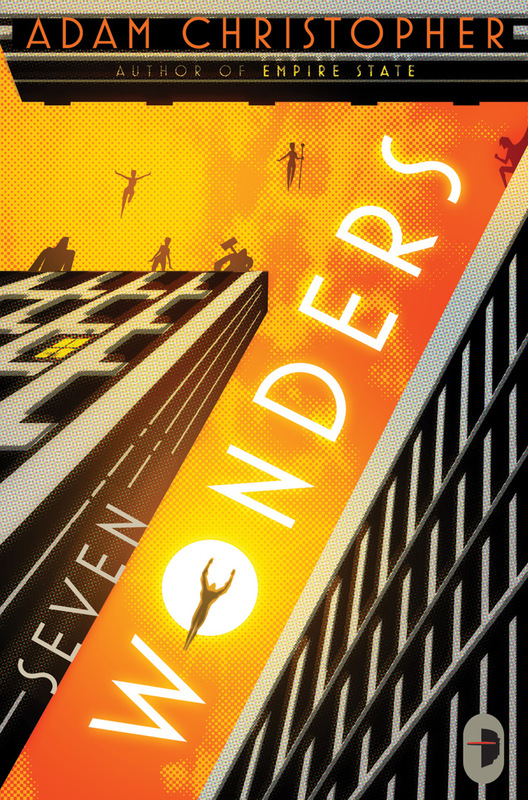 Seven Wonders is definitely an interesting book that certainly left me surprised more than I had expected. Just when I thought I had a clear peg of everything that was going on, the author would through another complication to change things even more. So I give the book a good 4 new powers that change Tony's life out of a possible 5.